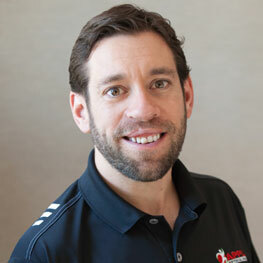 Adam received his Doctorate of Physical Therapy from Thomas Jefferson University in 2011. Before that, he earned his bachelor's degree, with a major in Psychology, from Rutgers, The State University of New Jersey. While a student at Thomas Jefferson University, Adam was chair of Hands of Hope, a student run organization that provides weekly pro bono Physical Therapy services to residents and patients of a men's homeless shelter in Philadelphia. Adam currently treats patients in our Marlton office. He prides himself on his ability to connect with and treat a wide variety of patients from pediatrics and teens to geriatrics and everything in between. Adam relies on current research to guide his practice to provide the most cutting edge care to his patient's with an emphasis on quality and individualized care. Adam was born and raised in Cherry Hill and strives to be an active member of the community. When not chasing his twin daughters, he enjoys running and participating in local road races.